Woodford Bros., Inc. can solve your crawl space problems with the CleanSpace® crawl space encapsulation system. Schedule your on-site evaluation and free cost estimate today! Before encapsulating your crawl space, it's important to take care of any water intrusion issues, including plumbing leaks, foundation leaks, and drainage problems to prevent water damage and keep your crawl space dry. Woodford Bros., Inc. can help stop water from coming into your crawl space by installing a perimeter drainage system and sump pump designed specifically for the crawl space. Are you ready to get started on your crawl space encapsulation project? As a professional crawl space repair contractor in Central New York, Woodford Bros., Inc. offers all the solutions you need for a clean, dry crawl space. 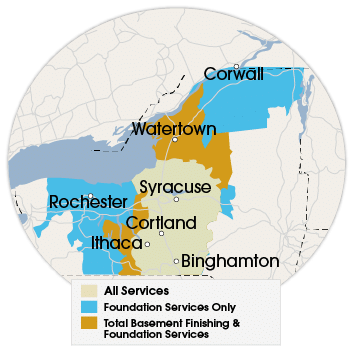 If you're in Syracuse, Binghamton, Utica, Rochester or the surrounding area, contact us today to schedule your on-site consultation and no-obligation cost estimate.